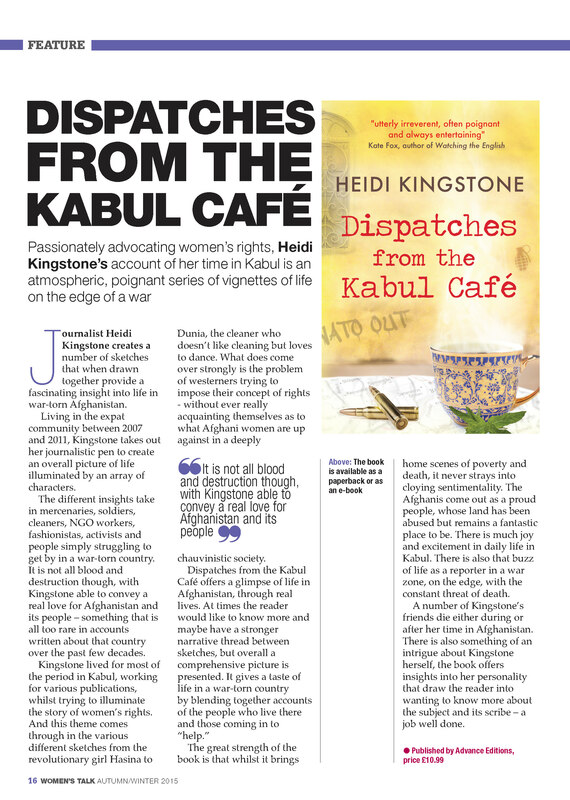 The latest edition of CWU‘s Women’s Talk includes a feature on Dispatches from the Kabul Cafe, which discusses its important messages about women’s rights. Journalist Heidi Kingstone creates a number of sketches that when drawn together provide a fascinating insight into life in war-torn Afghanistan. Living in the expat community between 2007 and 2011, Kingstone takes out her journalistic pen to create an overall picture of life illuminated by an array of characters. The different insights take in mercenaries, soldiers, cleaners, NGO workers, fashionistas, activists and people simply struggling to get by in a war-torn country. It is not all blood and destruction though, with Kingstone able to convey a real love for Afghanistan and its people – something that is all too rare in accounts written about that country over the past few decades.